Pink coral color. Aromas and flavors of fruit punch soda and bubblegum with a crisp, spritzy, moderately sweet light-to-medium body and a breezy finish that exhibits notes of watermelon and apple candies and mandarin oranges in syrup with no oak flavor. A clean, candied, tasty pink bubbly. Bottom Line: A clean, candied, tasty pink bubbly. Specialty wine is a catch all category for "special" wines, for lack of a better term. Examples could be from anywhere, even the Congo in Africa; one wine from there has tropical fruit flavors that taste more like Hawaiian Punch than wine; it also has a light peppery edge with light tannins. One can only imagine what other "special" wines are out there. 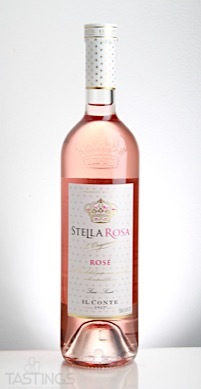 Stella Rosa NV Rosé Wine Specialty rating was calculated by tastings.com to be 88 points out of 100 on 4/5/2018. Please note that MSRP may have changed since the date of our review.